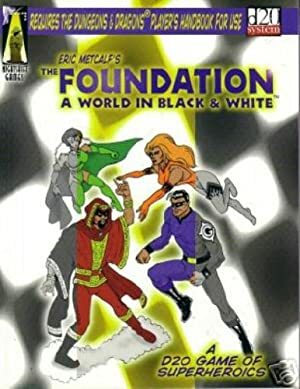 I think that The Foundation was the first d20 super-hero RPG. It wasn’t good, but here are a few characters from it. Gadgeteer. His most common powers are a personal force field and weapons that drain an opponent’s strenght or speed. While he has no compunction against killing, he rarely uses a lethal weapon himself. Jesse Cafferty was a skilled inventor who found conventional research too confining and boring. He came into contact with the Black King – a master criminal that was building a conspiracy against the US called the Shadow Empire. The Black King, a brilliant engineer, took him on as a pupil, teaching him about some of the more unusual technology he had developed. Jesse became a field test specialist, and later built his own devices. He was attached to the Black Queen’s team as technical support and help against especially difficult foes. Neutral Evil. Yep, that’s our boy. The Shadow Empire is your basic conspiracy with chess pieces ; it is probably better to take its members and turn them into henchmen for whatever conspiracy you use in your campaign and want to beef up.